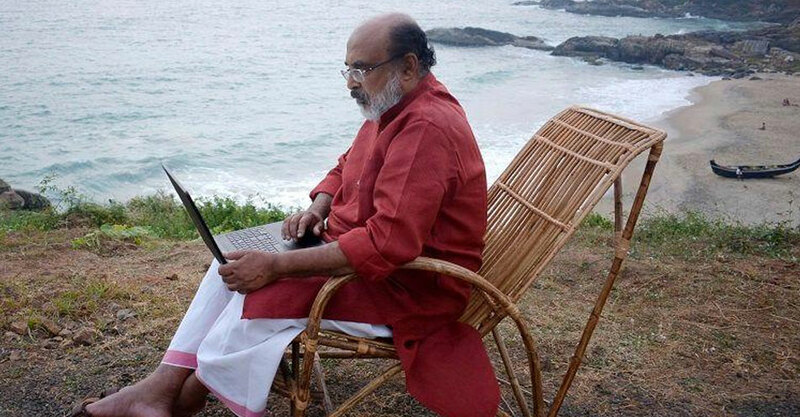 Kerala’s Finance Minister Thomas Isaac presented the Left Democratic Front (LDF) government’s third budget on Friday. And what really stood out was how he peppered his speech with literary references. As the Finance Minister addressed the issues of the state, including its fiscal deficit and announced new schemes and fund allocations for a slew of programmes, he chose to lace his speech with references from a number of Malayalam literary works. Kerala Assembly members, for one, appreciated this – many times, he was forced to pause due to the ringing applause. His speech on Friday morning began with him recounting the devastation caused by Cyclone Ockhi that hit the Kerala coast in November last year. At this point, Thomas decided to take a leaf out of the famous poet Sughathakumari’s work. “Sugathakumari’s teacher sang that the sea and the wind give strength to the shore. But thoughtless human intervention has now made nature take human lives. The sea and the wind are roaring after the devastation … but the shore shall not lose. Like the poet wrote, the children of Kadalamma will rise again,” he said. Speaking about how any disaster affects the women the most, he said that the aftermath of Ockhi provided enough proof to that statement. While the men – who ventured into the sea – died, then women were left behind to provide for their families. “It is the women who have to overcome the hurdles that life throws at her at such instances,” he said. The minister then proceeded to quote a line from Sarah Thomas’ novel Valakkar, where a character says that while the responsibility of men ends at fetching fish from the sea, it is the women who have to sell it in the market and run the household with that money. He also quoted a poem Adukkala, written by a school student during a poetry writing contest, to say that women were not getting their due share. Announcing the hunger-free project, Thomas borrowed a dialogue from a drama titled Vidhavavivaham (or Savithri) authored by Lalithambika Antharjanam, where the character talks about leading a lonely life, without the support of anyone. Quoting those lines, Thomas said that the hunger-free project was for those people, who, just like the character in the play, has no one to take care of them and do not have the wherewithal to eat a meal. Moving on to the Life Mission, a scheme to ensure housing to everyone in the state, Thomas once again sought the help of Malayalam literature to set the stage. This time, it was a father in Sarah Joseph’s novel Mattathi, who believed that anything was possible and maintained a diary of his dreams. “One of them was to ensure 100% housing for all. He has sighed many times over, looking at that. He always believed that those sighs had the capacity to make the dream come true. We will make this dream a reality, sir,” said Thomas, effortlessly linking the story to his budget speech. Next in the list were announcements in the health sector. Speaking about the need for affordable health services, Thomas recounted one of BM Suhara’s characters thinking about the grim face of his mother when she is forced to pawn her gold for her husband’s treatment. “In the novel Prakashathinumel Prakasham, the character laments that he must go to the Gulf to earn a living so that he could wipe out his mother’s tears,” he said. Speaking on the need for effective palliative care units, he borrowed an instance from writer Gracy’s novel Devangana, where a daughter hopes her mother dies than live than suffer through an illness again, when the latter’s cancer relapses. He then went on to borrow from several other works, including the image of a peaceful school from Indu Menon’s Kappalinekkurichoru Vichitra Jeevitham, when speaking about rejuvenating public schools. He also mentioned Savithri Rajeevan’s poem while speaking about social security pension. While announcing welfare schemes for differently abled people, the minister quoted from Jayashri Misra’s Ancient Promises, where the author describes the state of Kerala’s special schools. This is not all, Thomas drew references from Vijayalakshmi’s poem Pacha (Green), the play Thozhil Kendrathilekku, which takes about working women, a poem penned by Bilu C Narayanan and many others. This is not the first time Thomas has borrowed from literature to set the stage. In his speech last year, he extensively quoted from the works of Kerala write MT Vasudevan Nair.